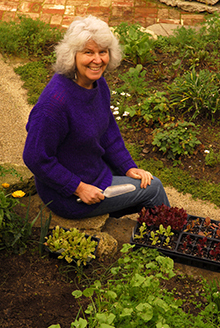 Pam Peirce is the author of the popular regional books Golden Gate Gardening: The Complete Guide to Year-Round Food Gardening in the San Francisco Bay Area and Coastal California (Third Edition) and Wildly Successful Plants: Northern California. Her writing and/or photographs also appear in many other books on gardening topics. She writes a monthly gardening almanac for the San Francisco Chronicle, which appears in the Food + Home Section--usually on the first Sunday of the month. Her articles appear on the website GardenZeus.com, a new interactive website created especially for California gardeners. Pam was a founding board member of the late, great, San Francisco League of Urban Gardeners (SLUG) and is a longtime San Francisco community gardener. She taught gardening and horticulture at City College of San Francisco for thirty years, and still teaches numerous classes at schools, to Master Gardeners, and to the general public in venues. Frequent lecture topics include Year-round food gardening, Small-space food gardening, Dining Gloriously from your Small Food Garden, Gardening in a Mediterranean Climate, and Growing Food in the Secret Season (Jan-March), and other horticultural topics, including Climate and Microclimate for Regional Gardeners, A Practical Guide to Common Plant Families, and Integrated Pest Management for Bay Area Gardeners. You can read more about Pam's activities and writing projects on her web site, pampeirce.com.